Requirements: Mac OS X 10.5. Universal. It seems like whenever I go on a trip, I forget something. I may forget to pack something, or I may forget where I wrote down some important information about the trip. These oversights, depending on their magnitude, can turn into anything from a minor annoyance to trip-ruining headache. Knapsack, Tiny Planet Software’s trip planning software, can help you minimize, or even eliminate these issues before you even board the plane by giving you an interface for all your trip planning needs. Then, when your trip is far in the rear-view mirror, you can refer back to Knapsack to see the highlights of you past experiences. Knapsack’s trip interface really tries to take into account everything you might need for your trip. Along with specifying the trip’s dates and location, Knapsack breaks your trip down, day-by-day, allowing you to record notes about the specific day and schedule either timed or un-timed activities. The trip itinerary contains a day-by-day breakdown, a to do list, and un-timed activities. Depending on the type of a trip, your plans may not be quite this set in stone. For instance, a business trip will likely have a set itinerary whereas as a family trip might have general goals (take the kids to the zoo) without specific scheduling needs. Knapsack recognizes this and also allows you to enter unscheduled activities and to-do items. Furthermore, since plans can change, you can reschedule your activities by dragging them between days and the unscheduled activities list. Although the flexibility in recording your trip plans is nice, I was initially a bit confused by the interface for creating activities and to-do items. There’s a single command for adding an activity and a single command for adding a to-do item. The function of Add Activity changes depending on the application focus. If you’ve selected a day in your itinerary, the new activity will be added to the selected day. When any other aspect of the trip itinerary is selected, an unscheduled activity is created. Conversely, to-do items are never associated with a day. It took me a while to figure this out, since I was expecting them to act analogously to activities. The inability to associate to-do items with days seems like an odd limitation. The shortcomings of the approach can be seen in the sample trips that Tiny Planet Software includes with Knapsack—day 1 of the sample National Parks Road Trip includes a reference to “Stop at REI near Vegas for supplies,” and the checklist contains an “REI Shopping List” item. With the exception of the similar titles, there’s absolutely no connection between the two related items. Recording a trip’s location is done entirely through the map. When editing a trip, you drop a pin on the map and specify a name. Trips can include multiple locations, but there doesn’t appear to be any way to tie a location to a specific portion of the trip. Although the map gives you a quick overview of where you’ve been just by looking at the pins, it’s not the most exact way of plotting your travels. There is no Google Maps–like search interface for placing a pin by location or address. Once you have placed a pin, you can move it by specifying a latitude and longitude. While latitude and longitude can be quite accurate, they’re not the easiest pieces of information to track down. Additionally, there doesn’t appear to be any way to re-use a pin. I currently have two trips planned for Miami. Each trip has its own pin, and they’re in ever-so-slightly different locations. It would’ve been nice if Knapsack could have just used the existing Miami pin when I entered the second trip. Complicating matters is the relatively poor quality of Knapsack’s map. While it looks fine at the lower zoom levels, it quickly become pixelated when you increase the zoom level. Also, the maximum zoom level isn’t that high—I was able to see most, if not all, of New England on the map at the maximum zoom level, even when I had Knapsack’s window at the smallest allowable size. Accurately placing pins can be difficult, even at higher zoom levels. 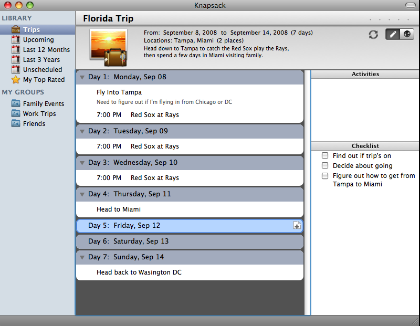 Knapsack uses the now-familiar iTunes-style source list for organizing your trips. In addition to viewing all of your trips, there are several smart collections which group your trips by certain criteria, typically the trip’s timing. There’s also a collection that displays your favorite trips, if you take the time to give your trips ratings of between 1 and 5 stars. You can also create your own groupings. As you can see in the earlier screen shot, I currently have groups for family trips, work trips, and trips involving friends. Like iTunes playlists or iPhoto albums, trips can be included in multiple groups. In addition to providing a navigational aid for locating trips, a group like my Work Trips group gives me a quick reference to the trips I’ve taken for job-related tasks. Having the information separated in this way could prove useful for things like classifying business expenses come tax time. At the very least, I’ll have a personal record of the work-related trips that I can refer back to when preparing information for an accountant. The pins on the map provide an additional way to view your your information about a trip. Clicking on a pin will display a postcard view of your trip that can include your description of the trip, your description of the location, and an image from the trip. Due to the aforementioned issue with pins and multiple trips, it’s not always possible to select a pin. Fortunately, you can filter the display pins by viewing a specific group. In the event that the trips containing the overlapping pins are in the same group, you view the pins for a specific group by double-clicking the trip in the trip list. The postcard view gives you a quick overview of a location from the map. Knapsack also includes a search feature for locating trips. The search functionality, however, seems a bit limited. While the search includes the trip name and description, it doesn’t appear to include any of the information about the locations or the trip itinerary. Getting information in and out of Knapsack is a bit of a mixed bag. On the positive side, Knapsack’s integration with iCal seems particularly impressive. Not only can you export a trip to iCal, but you can also sync a trip with iCal. In this latter mode, changes made to the trip’s calendar are mirrored back into Knapsack. This includes both the trip’s itinerary for a given day and the to-do items. Unscheduled activities are not synced, but it’s unclear what iCal would do with this information. Thus, even though Knapsack runs only on Mac OS X 10.5, you conceivably have many more options for viewing and editing information about your trips. For instance, I was able to create my trip in Knapsack, sync it to iCal, then modify the trip information on my iPhone. When I later synced my iPhone with my computer, the changes were reflected back in Knapsack. That’s not to say the process was perfect. At one point, I noticed an event on my iPhone had the wrong time duration, so I updated the end time. When I synced the change back to the computer, the event’s start time moved. I can’t be certain as to why this happened. I don’t believe I changed the start time on the phone, only the end time, but I could be mistaken. I wasn’t able to reproduce the effect in subsequent trials. Your other options for getting information out of Knapsack are rather limited. There is an export function, but this feature creates files which are only readable by other copies of Knapsack—it is apparently intended for sharing information with other Knapsack users. If you want to move your information out of Knapsack, particularly what you’ve written about the trip, it appears you are limited to copy and paste. Knapsack’s other touted sharing option is PDF. However, this is actually just the use of Mac OS X’s PDF Services via the print dialog. The printouts and PDF are certainly useful for sharing information about trip plans, but they are more functional than attractive. For instance, they include the name and description of your trip and its locations, but not any of the images you may have associated with said items. When I first heard about Knapsack, I was actually expecting something a little different—I thought more of the focus would be on post-trip logging than on pre-trip planning. At the time of Knapsack’s release, some friends were in the middle of touring Latin America and were writing a travel blog about their experiences. Based on Knapsack’s description, I thought it might be an interesting tool for such an endeavor, which is why I was expecting more options for sharing information. For something like my friends’ travel blog, the ability to send a write-up to a Weblog editor would be quite useful. Although it’s not exactly the application I was expecting, Knapsack is an interesting tool and it shows some promise. I appreciate that it lets me keep everything about a trip in a single application that’s focused on travel, as opposed to some general purpose tool that may not encompass all aspects of a trip. That said, there are definitely places where I think the application needs to be improved in the future. Copyright © 2008 Eric Blair, eblair@atpm.com. Reviewing in ATPM is open to anyone. If you’re interested, write to us at reviews@atpm.com. This article very clearly depicts the pros and cons of the software. It definitely affected my willingness to buy the software. Thank you. Thanks, Eric, for your review. We really appreciate the time you took to kick the tires and provide a fair evaluation of the features and limitations of Knapsack 1.1. Many of the items you mention have been brought up to us by our users and we have even touched on some of them already in our blog. In fact, iCal integration was added in 1.1 expressly because of the amount of user feedback we had for this feature ... plus, we wanted our trips on our iPhones, too. The next release of Knapsack will be focused on improving the map experience and more tightly integrating trip's locations with the itinerary. It's direct user feedback and reviews like yours that are helping to shape the future of Knapsack.